We hope all that attended the river trips that have been run enjoyed them and are looking forward to the next ones! An update on the pool sessions. There remains plenty of places on the pool sessions, particularly the 14 and under session next week and the one starting on the 27th November 2018. The pool session courses are run as a block of 3 sessions, over 3 consecutive weeks with coaching tailored towards individuals needs whether that be building confidence when falling out of a kayak or progressing all the way to learning to roll the kayak back up using the paddle. The pool sessions are held at Stonar School, Melksham. On each evening there are 2 courses, commencing 19:30 and 20:15 hrs respectively. There are 8 places available in each time slot. Each course (3 sessions) will cost £20 for club members (or £7 for an individual session where offered) and £30 for non-members (or £11 for an individual session where offered). Prior to booking your place, please first read the notes below (particularly with respect to eligibility), then fill out the pool sessions booking form linked here (If you can be flexible please identify a first and second choice of time slot) and send it along with a cheque made payable to “CSCC”, to the address on the form. Priority for course enrolment will be given to CSCC members, non-members will be considered as follows: Course 1 – after 25-Sep-18; Course 2 and One Off 14 and Under Only Session – after 9-Oct-18; Course 3 – after 6-Nov-18. Places cannot be reserved; receipt of monies by the pool session coordinator secures a place on a course where available. The club is unable to refund fees if you cannot attend. If the session is re-sold, a 75% refund will be provided with 25% retained to cover administration charges. In the first instance, it will only be possible to book one course per person for the winter term. If places remain they will be opened up to all, even those who have already attended a course. Please indicate First, Second, Third in the appropriate boxes in case your preferred session cannot be provided. 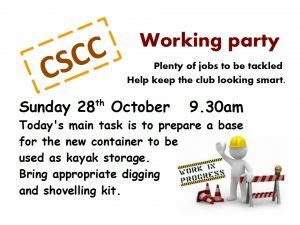 Each block of 3 consecutive sessions costs £20 per person for CSCC members, £30 for non CSCC members. Once the block of sessions has started any spare places can be booked individually for £7 per session for CSCC members or £11 for non CSCC members. The additional cost to non-members includes a temporary membership charge covering the pool sessions only. The pool at Stonar School, Melksham, SN12 8NT is accessed around the back of the school – up the main drive, bear right around the school buildings, just past the all-weather pitch. We hope everyone has had a good Summer season and is looking forward to the Winter Paddling season whether they are going to be running white water rivers or going our for some refreshing early morning paddles! We have a couple of event announcements that can be seen below. 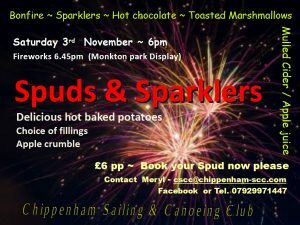 The 2018 Spuds and Sparklers evening is on the 3rd November. This is a great event, bring the family and any friends too. With a real bonfire to toast marshmallows on. Alongside our announcement of spuds and sparklers comes us getting a new storage container to store kayaks in, this will make room for our newly purchased kayaks. At the next working party we will be needing to prepare the land that the container is going to be situated on. Please see the below image for details about the working party. Thank you to all the hard work put in by all of our volunteers and committee members and we look forward to seeing some of you at our upcoming events. On Friday 12th at October 6pm CSCC are having a Social evening in line with our policy of keeping up events throughout the winter months. 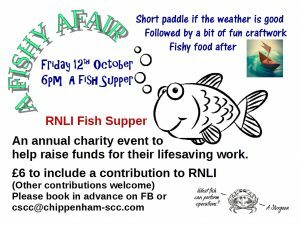 Join us for a bit with a bit of crafty fun (very easy) a scrummy fish meal and a good chat and catch up. If the weather is good then a short paddle first to work up an appetite. This is an RNLI event we are signed up or it so really want it to be well attended. Price of £6 is to include a contribution to the RNLI. Although we are only a river club, many of us use our coastal waters, it is a very worthy charity, so feel free to contribute any more pennies to our collection. Usual plea for numbers to the event for catering purposes.